If you are considering microblading as an alternative to continuously touching up your eyebrows every day, there are most likely many questions you have relating to the procedure. Like other cosmetic procedures, there are certain aspects of microblading that can be daunting ; however, we are here to tell you that when it comes to pain, microblading is not too bad. Microblading is a form of tattooing where tiny hair-sized lines are inked into your eyebrows. The aim of microblading is to give the look of having full-thickness eyebrows. With the amount of time it takes to groom and highlight eyebrows each day, it’s no wonder more people are deciding to have microblading procedures done on their brows. Microblading gives semi-permanent results that you will be happy with for years to come. They don’t require a lot of maintenance but do need touching up once a year. There is a big difference between microblading and tattoos. Tattoos use carbon based tattoo ink, where microblading uses iron oxide based pigment. What’s the difference? Carbon based tattoo ink is designed to stay in the skin forever. Iron oxide based pigment is designed to slowly fade over time. 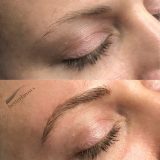 It is desirable for this slow fade so clients have the ability to make changes to their brows as years go on. Trends change, faces age, and skin changes through the years. Pigments allow clients the ability to always have current and flattering brows. For most people, the process of microblading may seem a little daunting. The process involves a tiny blade cutting lines into the skin of your face which are then filled with pigment. For some this thought alone can be enough to turn them away; however, it is often described as less painful than a bikini wax or laser skin treatment. Microblading is the perfect option for those who simply cannot grow full eyebrows. Whether from over plucking or from uneven hairlines in your brow, microblading is the solution that gives anyone and everyone perfect eyebrows. Different people have different tolerances to pain, and each person will feel the procedure of microblading differently to the next. The procedure itself will include lidocaine anesthetics to numb the area and create less pain. Better microblading specialists use a range of topical anesthetics to ensure limited pain is felt by patients. Many people who have had microblading completed claim the pain level is like having their eyebrows threaded, the procedure just lasts longer. Most microblading specialists will numb the brow area beforehand to avoid discomfort. Without anesthetics, you can feel every scratch. The process takes around 2 hours to complete so numbing creams or anesthetics should be strong enough to last the duration of the procedure.